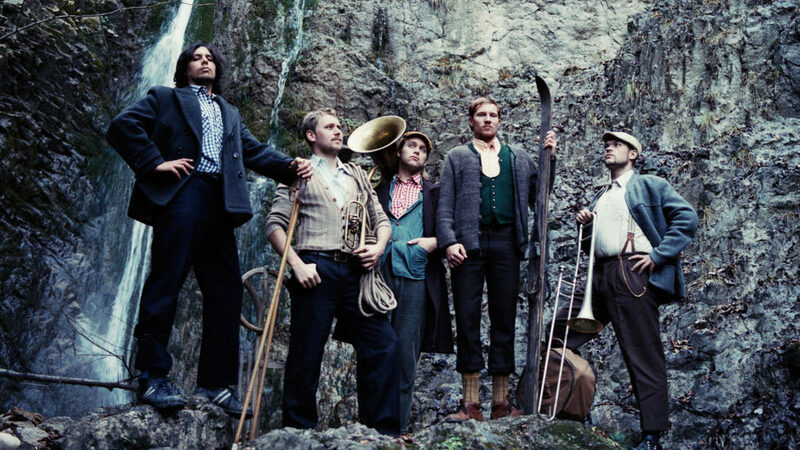 LaBrassBanda is a brass band from Bavaria (they hail from Übersee near the Chiemsee) led by trumpet player and singer Stefan Dettl, who formed the band 2007 together with bassist Oliver Wrage, tuba player Adreas Hofmeir, trombonist Manuel Winbeck and drummer Manuel da Coll. The group mixes folksy brass music with modern genres such as ska, techno, funk and punk. The band’s self-produced debut album Habediehre was released in 2008 and quikly boosted the popularity of the group, as did their tour from Übersee to Vienna on the occasion of the 2008 European soccer championship (the group used mopeds and a tractor instead of a tour bus). A second album called Übersee was released in 2009, and the band started playing international concerts (in Russia, Zimbabwe and Denmark). In 2011, LaBrassBanda took a break from their constant touring, which allowed every band-member to pursue solo projects. In 2012, the band released a live album called LIVE Olympiahalle München.